Wild: Found in small numbers within the Island's colder regions, Chalicotherium obsideoquus is normally a peaceful herbivore that prefers to spend its days lazing about or playing with it's family. It is very territorial, however, and the entire family, young and old, will turn against an encroaching creature at just the slightest provocation. Domesticated: While many creatures are useful while attacking a fortress, Chalicotherium can be trained as mobile artillery. Its unique playtime habit becomes a rather devastating long-range assault tactic when it is given boulders to throw, rather than snowballs! Known Information: A strange scene to stumble upon is a group of Chalicotherium playing. One odd playtime activity for Chalicotherium is hurling large balls of snow or mud-rocks at each other. Smaller creatures in the area shy away from Chalicotherium during this exertion, for fear of being buried in snow or gravel. 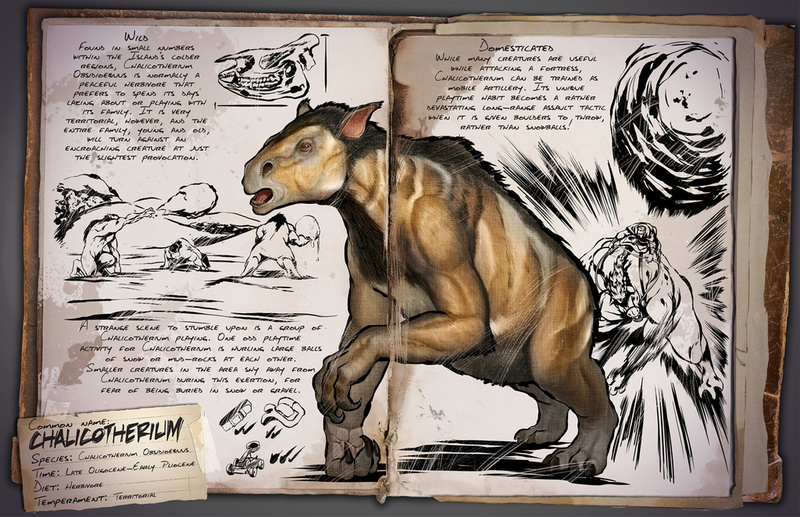 Das Chalicotherium fehlt im Taming Calculator! Wär toll, wenn das mal wer hinzufügen würde.